Last week my hatred of air travel was solidified after I threw up all over myself on the last leg of my flight to Florida. I was already not thrilled about this trip, and sitting in my own vomit for a couple of hours did not improve my mood. I was not visiting Florida for pleasure, but I was determined to cram at least some fun into my experience, and nothing says fun like GATORS! After I wrapped up the business end of my trip I went to the Saint Augustine Alligator Park, which has albino alligators, a Komodo dragon, and lots of other awesome reptiles. 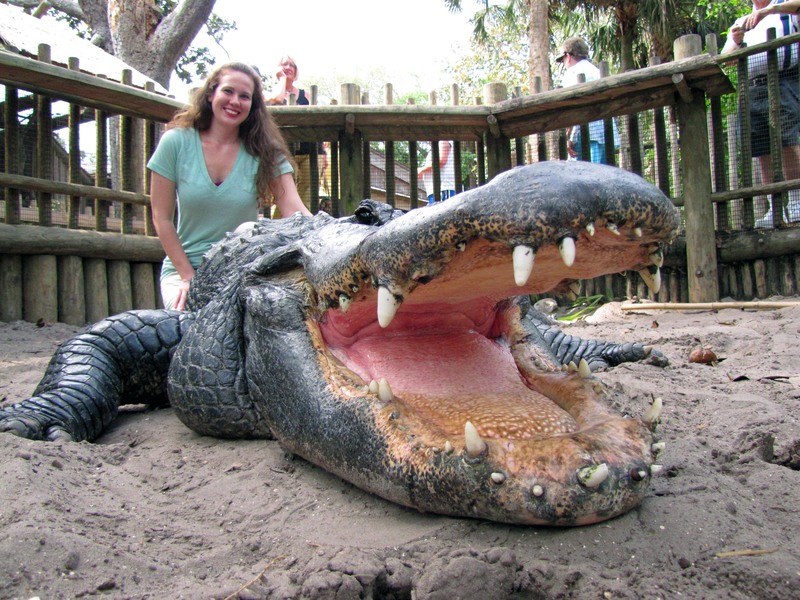 Number 17 on my 35 Before 35 list is Pet a Live Alligator, and I got to do way more than that! This little guy is about three years old and was very sweet. 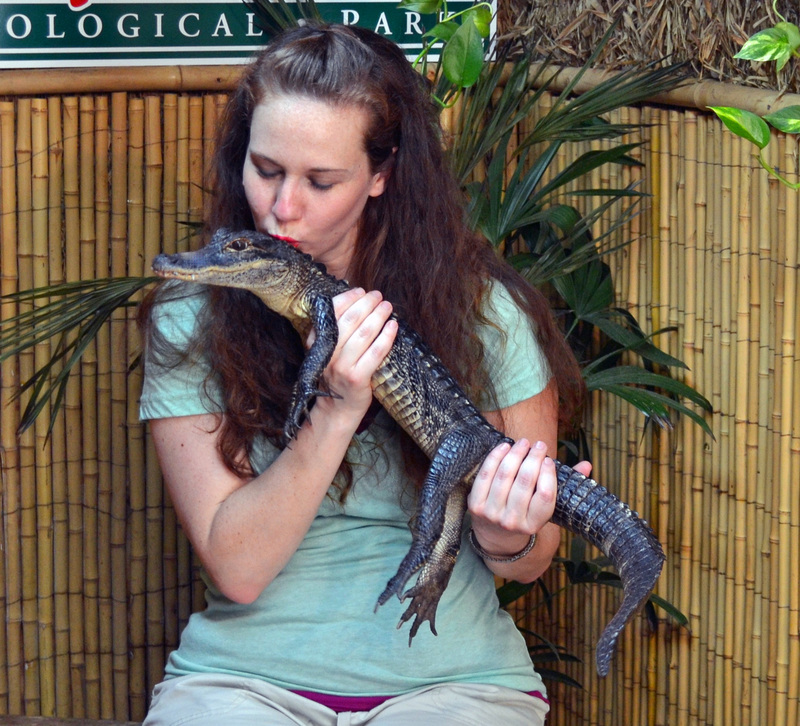 What is that line about “You have to kiss a lot of gators…”? Hanging out with the baby gator was cool, but I wanted to pet an adult. This big guy is named Chip and he is about 12 feet long. I was in the pit with about 39 alligators and I told the guy with the camera to just keep snapping pictures no matter what happens. If I am going to get my arm ripped off, I at least want some good pictures! Chip’s skin was tougher than I thought it would be. I knew alligators had tough hides, but his back was almost like a suit of armor. I wonder how difficult it would be to smuggle a baby gator back to Italy? This entry was posted in Uncategorized and tagged 35 Before 35, Animals, Florida, Travel. Bookmark the permalink. Wow that’s awesome!!! How did you know he wasn’t going to eat you!?!? I have watched two whole seasons of Swamp People, that gator didn’t stand a chance against me!! Oh my goodness! That’s awesome! I think they let you pet everything in Florida. 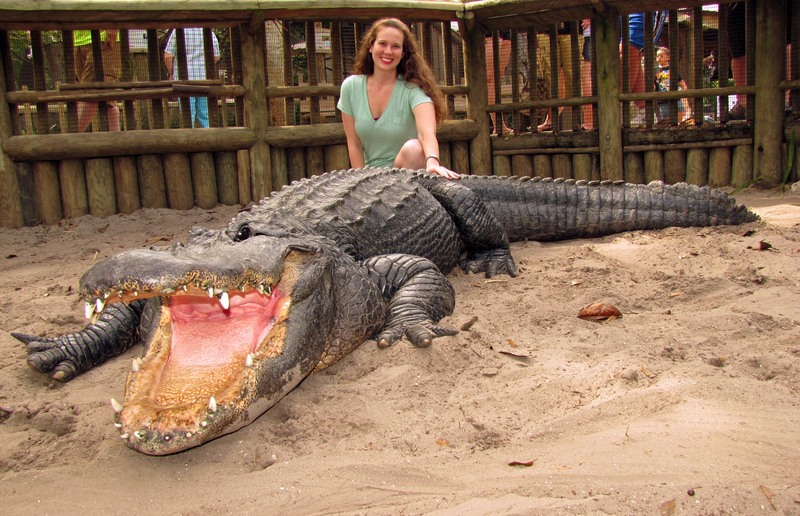 Alligators, wolves, dolphins, tigers…. Yeah, Florida is awesome! I might have to move there someday.